We are the company you want where quality and price meet. "Get the quality at an affordable price"
Absolute Home Improvements is your one stop Milwaukee contractor providing services in all of SE Wisconsin. Whether you’re looking for ways to save energy in your home or your homes in need of some TLC’s, we can help! From roofing, siding, gutters, windows, doors to kitchens, baths, basements and attics. We can find you ways to save energy and give your home the appearance you always imagined. 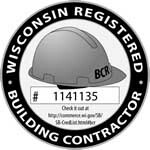 We provide exterior Waukesha and Milwaukee contractor services for chimneys, decks, entry doors, patio doors, replacement windows, fences, seamless gutters and energy efficient siding. We also provide interior Waukesha and Milwaukee contractor services for kitchen remodels, bathroom remodels, basement remodels, attic remodels, flooring, interior doors, insulation and more. So when you’re ready for your next project give us a call and you’ll be on your way to savings.